The food and casual atmosphere are not the only draws at Jane Q; a beautifully designed space with marble tabletops, a black and white color scheme, and gold accents all lend the space a modernity that's clearly very on-trend yet feels like a brand new addition to Hollywood. 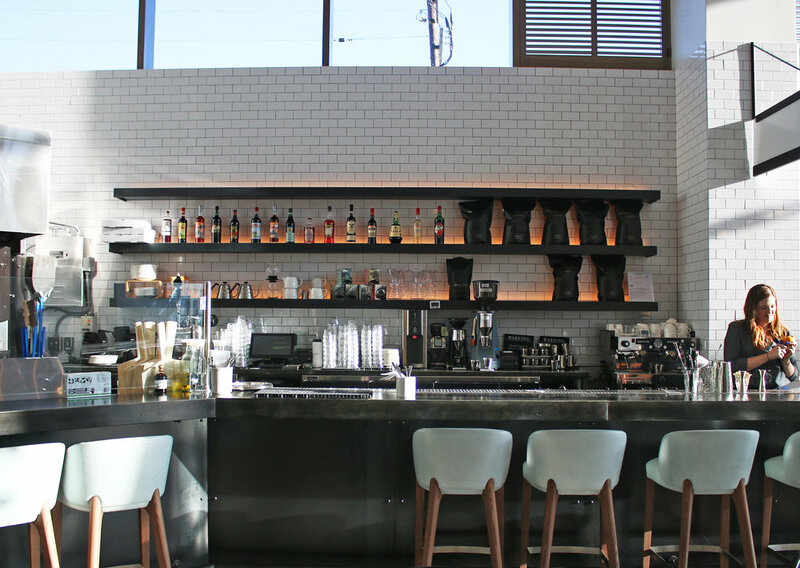 The all-day menu includes a handful of simple, classic cocktails in addition to their coffee, beer, and wine menus. Though you can definitely get a fresh drink (like this sparkly negroni with prosecco), the real drinking happens upstairs at the Ever Bar, another beautiful spot with a much more serious cocktail list that would make for an excellent date spot or drinks meet-up. The food menu is certainly an eclectic mix, with a separate breakfast menu that's served until 11am, and then the all-day fare takes over. 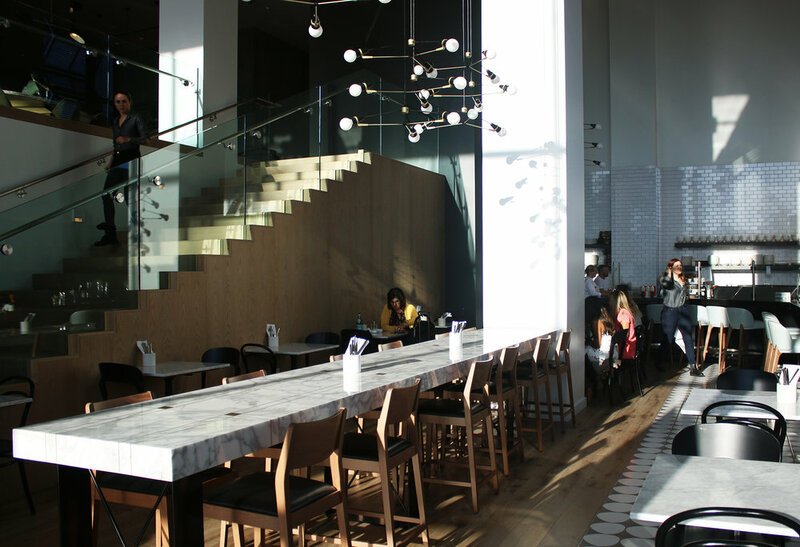 There are light, small plates like burrata & peaches as well as a few different salads and veggie dishes, and then a "hearth" menu with pizzas, a garlic knot, and some heavier fare. It's an interesting mix for sure, and if I had one small gripe about the menu in general, I would love to see a few more protein options (without a carb vessel). But anyways, we had to order the Truffle Calzone...because duh. While to me it was more of a truffle quesadilla, it was nevertheless really fun. The truffle was not overwhelming, but boasted a subtle earthy flavor (the chef uses real shaved truffles, and stays away from the artificial flavor of truffle oil), while the dough was slightly thick and oozed cheese. It's definitely a fun treat, and would make a great shared plate for a table. We moved on to the Avocado Parfait, which was their take on an avocado toast. Whipped avocado with a layer of yogurt was served in a glass next to some housemade focaccia (yum), contrasting the cold, creamy parfait with the warm, toasted bread. It was a very light dish, with a bit of a tangy punch (as well as some veggies if I recall) from the parfait. It's certainly not as avocado-flavored as your typical avocado toast, but still makes a great light snack or breakfast option. 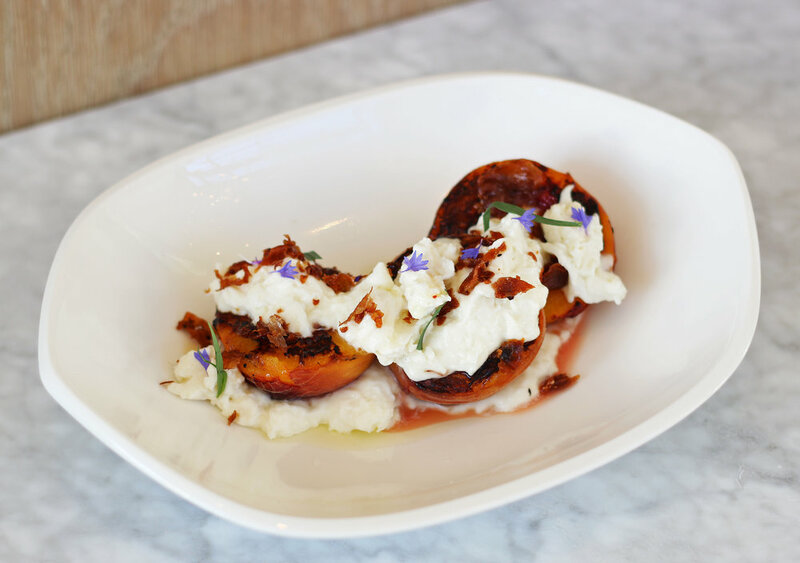 A classic combination, the burrata and peaches were a lovely summer appetizer. The creamy burrata was fantastic, while the grilled peaches were sweet and fruity. Some crisp country ham offset the softer textures of the dish, while the maple vinegar added another small dose of sweetness. As it's a dish that could be an appetizer or dessert, it was definitely a treat. One of the highlights of the meal for me was the heirloom eggplant. The eggplant itself had a bit of a crispy skin, while it was soft and tender on the inside. Tahini yogurt provided some welcome mediterranean flavors, and garlic chips were another fun addition. It was such a simple but creative offering, and while I loved the lightness of everything, the dish still packed some serious flavor. Another light bite, the Buttermilk Panna Cotta was a really fun dessert. The panna cotta itself was creamy and slightly tangy, while the stone fruit was a great complement. I particularly loved the gingerbread crumble, which tied everything together and made this definitely feel like dessert. Overall, our meal at Jane Q was really fun. I appreciated the fresh food, creative offerings, and varied menu. It's undoubtedly a fun, beautiful spot to stop in for a casual bite to eat when you're in the neighborhood and in need of a respite from the craziness of Hollywood.